Germany can boast running the first hydrogen-powered trains in the world. Image credits Frank Paukstat / Flickr. As of this Monday, passengers from the towns of Cuxhaven, Bremerhaven, Bremervoerde, and Buxtehude (all of them just west of Hamburg) can embark on a unique experience — on a train. Two Coradia iLint locomotives — designed and built by Alstom, the same company behind the bullet train — will ‘burn’ through hydrogen fuel cells to take these passengers for a ride. People like fast trains. At the time of their unveiling, trains such as Japan’s bullet train and the French TGV made headlines, set records, and captured the public’s imagination. But going fast isn’t the only desirable quality in a train. For example, the TGV imposed itself, along with its electric transmission, during the 1973 oil crisis in France. As Europe works to decouple its economy from fossil fuels, French company Alstom wants to provide them with trains made to measure. The company is now working to replace Germany’s old diesel-powered trains with hydrogen ones. Alstom CEO Henri Poupart-Lafarge inaugurated the first pair of such trains — christened Coradia iLint — at a ceremony in Bremervoerde, where the trains will undergo hydrogen refueling. “The world’s first hydrogen train is entering into commercial service and is ready for serial production,” he said during the event. The trains, painted bright blue, will run along a 100-kilometer (62-mile) long stretch of track. However, they can travel up to 1,000 kilometers (600 miles) on a single tank of hydrogen, the company reports. Hydrogen engines draw on fuel cells to produce electricity. Hydrogen in these cells is combined with oxygen in the atmosphere to generate power, and their only exhaust product is pure water and steam. The engines in the Coradia iLints are very efficient, so the vehicles come equipped with banks of ion-lithium to make sure no charge is wasted. They’re much quieter than their diesel-fueled counterparts, more eco-friendly, and have the upper hand on electric trains as they can run on any stretch of track, electrified or not. Their only down-side is a higher initial cost. “Sure, buying a hydrogen train is somewhat more expensive than a diesel train, but it is cheaper to run,” says Stefan Schrank, Alstom’s project manager. For their part, Germans seem to really dig the trains. Alstom reported that it has already signed a contract to deliver 14 trains in the Lower Saxony (northern Germany) region by 2021. The trains will be delivered to the local transport authority of Lower Saxony (LNVG), which will, in turn, lease them to a contracted train operator, the Eisenbahnen und Verkehrsbetriebe Elbe-Weser GmbH (EVB). France is also working to acquire hydrogen-powered trains, which it plans to have ready by 2022. Other European countries, including the U.K, Netherlands, Norway, Denmark, and Italy, have also expressed an interest in such vehicles, as did Canada. 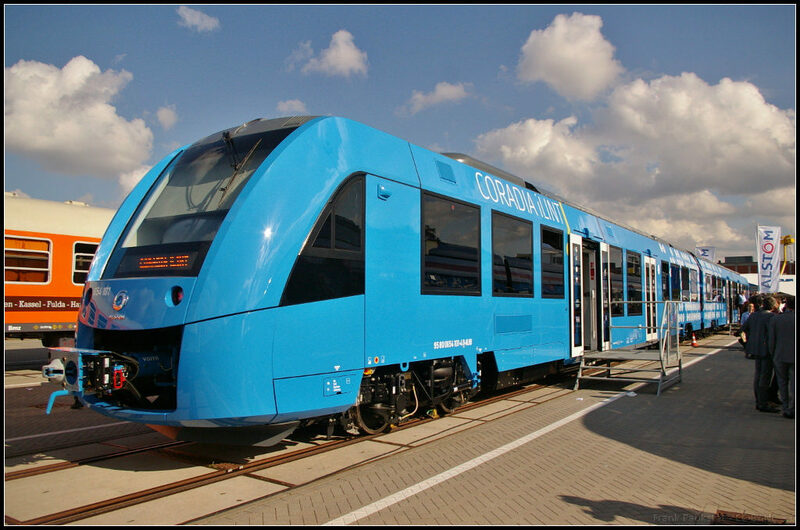 The Coradia iLint was first showcased at the rail industry trade fair InnoTrans in 2016, where the company boldly named it “train of the future”; we can only hope that their boast proves true.